Reindeer, known as caribou when wild in North America, are an Arctic and Subarctic-dwelling deer (Rangifer tarandus), similar to the elk and characterized by being the only deer in which both males and females have antlers. Rangifer trarandus has a circumpolar distribution, being found in northern regions (tundra and northern forests) of Eurasia (Scandinavia to Siberia) and in North America. Both reindeer and caribou are the same species, but semi-domesticated, domesticated, and wild members in Eurasia and domesticated members in North America are known as reindeer, while the wild members found in North America are known as caribou. They are highly migratory, traveling in large herds between summer and winter ranges. There are several recognized subspecies of caribou. 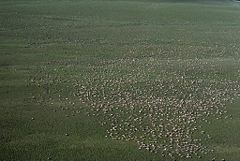 Caribou offer innumerable values for the ecosystem and humans. They are integral to food chains in northern climates, consuming such foods as lichens, leaves, and grasses, and provide food for predators such as wolves, wolverines, lynx, and bears. For humans, they have been an integral hunting resource for tens of thousands of years, and have been domesticated and raised for meat, hides, antlers, milk, and transportation. They have been economically important for all circumpolar peoples. Reindeer antlers grow again each year under a layer of fur called velvet. This reindeer is currently losing the velvet layer on one of its antlers. As deer, caribou/reindeer are members of the Cervidae family of the order Artiodactyla, or even-toed hoofed mammals, with two large and two small hooves on each foot. Deer differ from other hoofed mammals in that almost all species have antlers; other ruminants have horns. Antlers consist of bony outgrowths from the head with no covering of keratin, as is found in true horns. Antlers develop each year, usually in summer. The males, and only the males, of most species of deer develop antlers, with the exception of the caribou (reindeer), in which females also have antlers. A young buck's first pair of antlers grow from two tiny bumps on their head that they have had from birth. Each year, the antlers grow wrapped in a thick layer of blood-rich skin called "velvet" and remain that way until the bone inside is hard; later the velvet is shed. During the mating season, bucks use their antlers to fight one another for the opportunity to attract mates in a given herd. Antlers are also considered to make the males more attractive to the females by showing maturity and good health. Sometime after the mating season, the antlers drop off and the deer is antlerless until the next summer. In the Scandinavian variety or reindeer, the antlers for old males fall off in December, for young males in the early spring, and for females, summer. The antlers typically have two separate groups of points, a lower and upper. The weight of a female varies between 60 and 170 kg (132-375 lb). In some subspecies, the male is only slightly larger; in others, the male can weigh up to 300 kg (661 lb). Domesticated reindeer are shorter-legged and heavier than their wild counterparts. The caribou of North America can run at speeds up to 80 km/h (50 MPH) and may travel 5,000 km (3,000 mi) in a year. As members of the Ruminantia suborder, deer are ruminants; that is, they digest their food in two steps, first by eating the raw material and regurgitating a semi-digested form known as cud, then by eating the cud, a process called ruminating. Other ruminants include cattle, goats, bison, and antelope, as well as camels and llamas. Reindeer have a four-chambered stomach. Reindeer (caribou) mainly eat lichens in winter, especially reindeer moss. However, they also eat the leaves of willows and birches, as well as sedges and grasses. There is some evidence to suggest that on occasion they will also feed on lemmings (Robinson 2007), arctic char, and bird eggs (Anand-Wheeler 2002). Members of Rangifer trarandus have specialized noses featuring nasal turbinate bones that dramatically increase the surface area within the nostrils. Incoming cold air is warmed by the animal's body heat before entering the lungs, and water is condensed from the expired air and captured before the deer's breath is exhaled. This is valuable for moistening dry incoming air and possibly absorbing it into the blood through the mucous membranes. Caribou hooves adapt to the season: In the summer, when the tundra is soft and wet, the footpads become spongy and provide extra traction. In the winter, the pads shrink and tighten, exposing the rim of the hoof, which cuts into the ice and crusted snow to keep the animal from slipping. This also enables them to dig down. In the winter, the fleshy pads on these toes grow longer and form a tough, hornlike rim. Caribou use these large, sharp-edged hooves to dig through the snow and uncover the lichens that sustain them in winter months. Biologists call this activity "cratering" because of the crater-like cavity the caribou’s hooves leave in the snow" (Rodden et al.). The coat of caribou (reindeer) has two layers of fur, a dense woolly undercoat and longer-haired overcoat consisting of hollow, air-filled hairs. A caribou or reindeer swims easily and fast; migrating herds will not hesitate to swim across a large lake or broad river. In the wild, most members of Rangifer trarandus migrate in large herds between their birthing habitat and their winter habitat. Their wide hooves help the animals move through snow and tundra; they also help propel the animal when it swims. Males usually split apart from the group and become solitary, while the remaining herd consists mostly of females, usually a matriarchy. 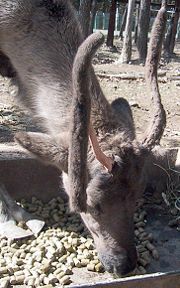 Southern-most reindeer: a South Georgian reindeer with velvet-covered antlers. The reindeer is distributed throughout a number of northern locales. Reindeer are found in northern Scandinavia; at Spitsbergen; in European parts of Russia including northern Russia and Novaya Zemlya; in the Asian parts of Russia; northern Mongolia; northeastern China to the Pacific Ocean. In 1952, reindeer were reintroduced to Scotland, as the natural stock had become extinct, probably in the tenth century. The caribou (known as reindeer in Europe and Eureasia) is found in North America in Canada and Alaska, and in Greenland. Until the early nineteenth century, it still occurred in southern Idaho (Nowak 1999). Domesticated reindeer are mostly found in northern Scandinavia and Russia, and wild reindeer are mostly found in Norway, North America, Greenland, and Iceland (where they were introduced by humans in the eighteenth century). The last wild reindeer in Europe are found in portions of southern Norway. The southern boundary of the species' natural range is approximately at 62° north latitude. 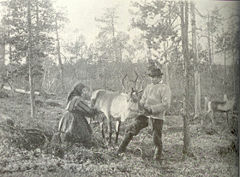 A few reindeer from Norway were introduced to the South Atlantic island of South Georgia in the beginning of the twentieth century. Today there are two distinct herds still thriving there, permanently separated by glaciers. Their total numbers are no more than a few thousand. Woodland Caribou (R. tarandus caribou), or forest caribou, once found in the North American taiga (boreal forest) from Alaska to Newfoundland and Labrador and as far south as New England and Washington. 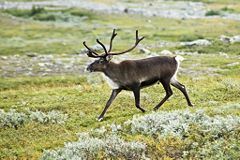 Woodland Caribou have disappeared from most of their original southern range and are considered "threatened" where they remain, with the notable exception of the Migratory Woodland Caribou of northern Quebec and Labrador, Canada. The name of the Cariboo district of central British Columbia relates to their once-large numbers there, but they have almost vanished from that area in the last century. A herd is protected in the Caribou Mountains in Alberta. Arctic reindeer (R. tarandus eogroenlandicus), an extinct subspecies found until 1900, in eastern Greenland. Finnish Forest Reindeer (R. tarandus fennicus), found in the wild in only two areas of the Fennoscandia peninsula of Northern Europe, in Finnish/Russian Karelia, and a small population in central south Finland. The Karelia population reaches far into Russia, however; so far that it remains an open question whether reindeer further to the east are R. t. fennicus as well. Porcupine caribou, or Grant's Caribou, (R. tarandus granti) which are found in Alaska, the Yukon and the Northwest Territories of Canada. Barren-ground Caribou (R. tarandus groenlandicus), found in Nunavut and the Northwest Territories of Canada and in western Greenland. 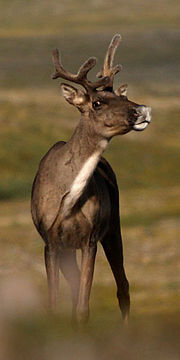 Peary Caribou (R. tarandus pearyi), found in the northern islands of the Nunavut and the Northwest Territories of Canada. Svalbard Reindeer (R. tarandus platyrhynchus), found on the Svalbard islands of Norway, is the smallest subspecies of reindeer. Mountain/Wild Reindeer (R. tarandus tarandus), found in the Arctic tundra of Eurasia, including the Fennoscandia peninsula of Northern Europe. Queen Charlotte Islands caribou (R. tarandus dawsoni) is an extinct subspecies that had once lived in Graham Island, British Columbia, Canada. About one million caribou live in Alaska, and a comparable number live in northern Canada. There are an estimated five million reindeer in Eurasia, mainly semi-domesticated. The last remaining European herds of the genetic wild reindeer (of the subspecies tarandus) are found in central Norway, mainly in the mountainous areas of the Rondane National Park, Dovrefjell-Sunndalsfjella (see Dovrefjell-Sunndalsfjella National Park), Hardangervidda and Setesdalsheiene. Genetic analysis has shown this, and that the reindeer in Rondane and Dovrefjell is of Beringia origin, other wild Norwegian reindeer are of European origin and have interbred with domesticated reindeer to a various extent, the reindeer in Hardangervidda and Setesdalsheiane only to a limited extent. Some areas, such as Filefjell, have populations of reindeer that have been herded in the past but are now left free. Scandinavian domesticated reindeer are supposed to be a mixture of the two subspecies tarandus and fennicus—mountain and Finnish woodland reindeer. Natural threats to reindeer include avalanches and predators such as wolves, wolverines, lynx, and bears. Golden eagles may be seen to kill calves up to 1/2 year by using their talons to puncture their lungs. Parasites include warble flies, mosquitoes, ticks, and nose bot flies. Roundworms, tapeworms (NLA 2004), meningeal worms (Paralaphostrongylus tenius), and sarcocystis can also afflict reindeer. In some Canadian provinces, caribou are commonly infected with giant liver fluke, Fascioloides magna (Pybus 2001). Diseases include brucellosis, foot rot, and keratitis (white-eye, an infection of the eye), and sarcocystosis. In Canada, the woodland caribou is under threat from extensive logging operations. Because the caribou need the boreal forest to survive, the destruction of this habitat has put this animal at risk of extinction. Logging and logging roads also attract deer (and deer diseases) and moose, which brings in predators such as hunters, wolves, and bears. 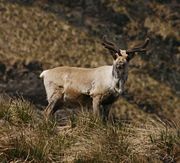 In May 2002, the Canadian Species at Risk Act listed the Atlantic-Gaspésie population of Woodland Caribou as endangered. Reindeer hunting by humans has a very long history and caribou/wild reindeer "may well be the species of single greatest importance in the entire anthropological literature on hunting" (Burch 1972). For people in the many northern boreal forests and tundra regions of North America and Eurasia, the species has been a very important resource, with humans depending on caribou/reindeer beginning in the Middle Pleistocene (Burch 1972). This dependency is not only over a time span of tens of thousands of years, but also over a tremendous geographic area (Burch 1972). Humans started hunting reindeer in the Mesolithic and Neolithic periods and humans are today the main predator in many areas. Norway and Greenland have unbroken traditions of hunting wild reindeer from the ice age until the present day. In the non-forested mountains of central Norway, such as Jotunheimen, it is still possible to find remains of stone-built trapping pits, guiding fences, and bow rests, built especially for hunting reindeer. These can, with some certainty, be dated to the Migration Period (300 to 700 C.E. in Europe), although it is not unlikely that they have been in use since the Stone Age. In absence of other great predators in significant populations, hunting is today a necessary means of controlling stocks in order to prevent overgrazing and eventually mass death from starvation. Norway is now preparing to apply for nomination as a World Heritage Site for areas with traces and traditions of reindeer hunting in Central Sørlandet (Southern Norway). Wild caribou are still hunted in North America and Greenland. In the traditional lifestyle of the Inuit people, Northern First Nations people, Alaska Natives, and the Kalaallit of Greenland, the caribou is an important source of food, clothing, shelter, and tools. Reindeer have been herded for centuries by several Arctic people, including the Sami and the Nenets. They are raised for their meat, hides, antlers, and (especially formerly) also for milk and transportation. Reindeer are not considered fully domesticated, as they generally roam free on pasture grounds. In traditional nomadic herding, reindeer herders migrate with their herds between coast and inland areas according to an annual migration route, and herds are keenly tended. However, reindeer have never been bred in captivity, though they were tamed for milking as well as for use as drought animals or beasts of burden. The use of reindeer as semi-domesticated livestock in Alaska was introduced in the late 1800s, by Sheldon Jackson as a means of providing a livelihood for Native peoples there. The reindeer has (or has had) an important economic role for all circumpolar peoples, including the Sami, Nenets, Khants, Evenks, Yukaghirs, Chukchi, and Koryaks in Eurasia. It is believed that domestication started between Bronze Age-Iron Age. Siberian deer-owners also use the reindeer to ride on. (Siberian reindeer are larger than their Scandinavian relatives.) For breeders, a single owner may own hundreds or even thousands of animals. The numbers of Russian herders have been drastically reduced since the fall of the Soviet Union. The fur and meat is sold, which is an important source of income. Reindeer introduced into Alaska near the end of the nineteenth century interbreed with native caribou subspecies there. Reindeer herders on the Seward Peninsula have experienced significant losses to their herds from animals (such as wolves) following the wild caribou during their migrations. Reindeer meat is popular in the Scandinavian countries. Reindeer meatballs are sold canned. Sautéed reindeer is the best-known dish in Lapland. In Alaska, reindeer sausage is sold locally to supermarkets and grocery stores. Reindeer antler is powdered and sold as an aphrodisiac and nutritional or medicinal supplement to Asian markets. There is an ox shaped like a stag. In the middle of its forehead a single horn grows between its ears, taller and straighter than the animal horns with which we are familiar. At the top this horn spreads out like the palm of a hand or the branches of a tree. The females are of the same form as the males, and their horns are the same shape and size. Burch, E. S. 1972. The caribou/Wild reindeer as a human resource. American Antiquity 37(3): 339-368. Deer Specialist Group. 1996. Rangifer tarandus. 2006 IUCN Red List of Threatened Species. Retrieved on November 28, 2007. Newfoundland and Labrador Agriculture (NLA). 2004. Parasites of caribou (3): Tapeworm cysts. Newfoundland and Labrador Agriculture. Retrieved November 28, 2007. Robinson, J. B. 2007. Dream hunts: Caribou on the move. Field & Stream. Retrieved November 28, 2007. Rodden, R., D. Talarico, and K. Madsen. n.d. Project Caribou: An educator's guide to wild caribou of North America. Project Caribou. Retrieved November 28, 2007. All links retrieved January 11, 2017. Adaptations To life in the arctic. This page was last modified on 11 January 2017, at 16:34.